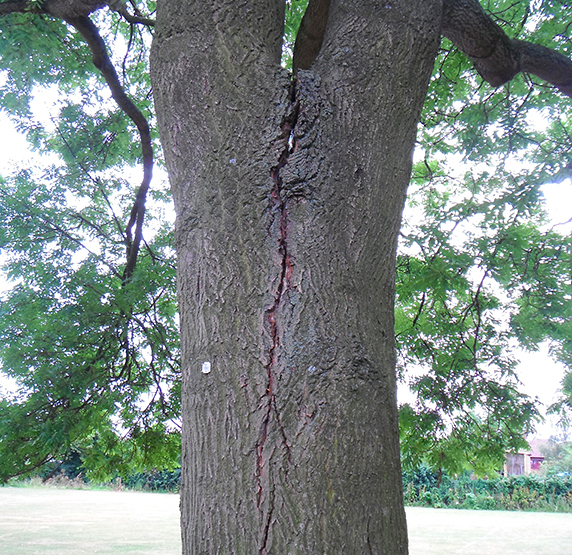 Often as part of a tree survey, features such as areas of decay cracks or cavities can be found, and this can raise doubts in the mind of surveyors, tree workers and owners. At Barnes Associates Ltd we have years of experience in a wide range of devices that enable us to assess the interior of a tree without the need to drill, which can cause significant damage. Basic information can be provided by simply recording the time taken for a sound wave to travel across a stem using a Microsecond Timer . Comparison of the predicted time based upon the known species and distance between the sensors can provide valuable information on the extent of decay or the location and depth of cracks. This is really useful tool for climbing inspections. For more detailed assessment we take the principal of speed of sound moving in wood and apply this to multiple sensors arranged around the stem in a process known as Sonic Tomography, using an Arborsonic 3D Tomograph. 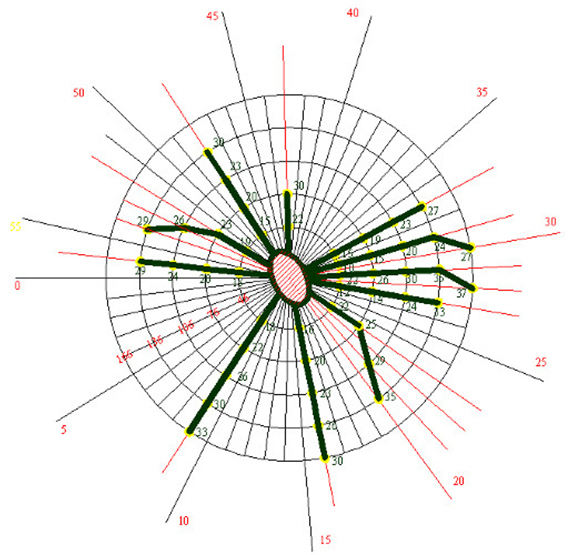 This system produces an image to represent the speed of sound and from this we can get information on the location and size of defects and by adding multiple layers we can begin to understand the three-dimensional aspect of decay in a tree. This method can be complimented by Electrical Impedance Tomography. In this related assessment method an electrical charge is created within the tree and the strength of the charge is measured at different locations. 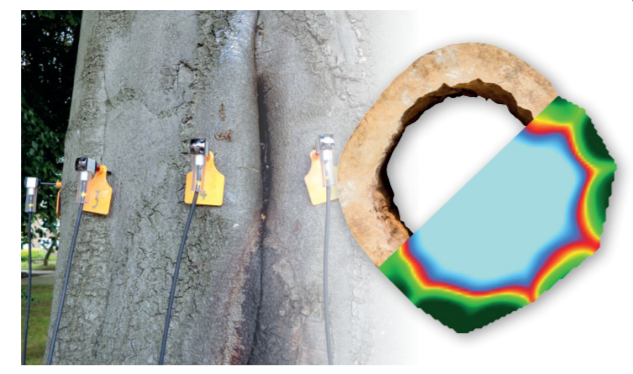 By using the ArborElectro it is possible to identify areas of high and low moisture content in a tree, the location of incipient decay / fungal colonisation or assess dysfunctional vessels. Where an assessment has raised doubts over a whole trees stability or where tree root damage is suspected through the presence of decay fungi or following potential damage from excavation or trenching we have a range of methods that allow the assessment of a tree in its entirety. By combining accurate measurements of a trees response at the buttress or within its stem to a known load it is possible to comment upon a trees response to a forecasted storm event and provide a safety factor based upon engineering standards. This static load assessment method commonly referred to as ‘Tree Pulling’ enables an assessment of a whole tree’s safety to be undertaken, which can be a difficult question to answer using other methods. Alternatively, we can measure the response of a tree to real world wind loads recorded using an anemometer near the tree. 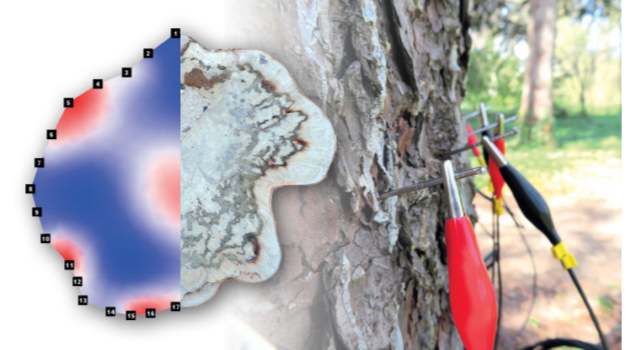 The Dynaroot system provides an insight into the trees response to real site forces. Where access is restricted, or stability is in question from multiple directions, we can assess trees measuring a trees response to a known wind load and this can be used to forecast a trees response to an expected storm event and provide a safety factor based upon engineering standards. Often the first thing that people notice about a declining tree is a change in foliage colour size or distribution which by then it may be too late for a tree to be managed or its condition turned sufficiently to enable a recovery. 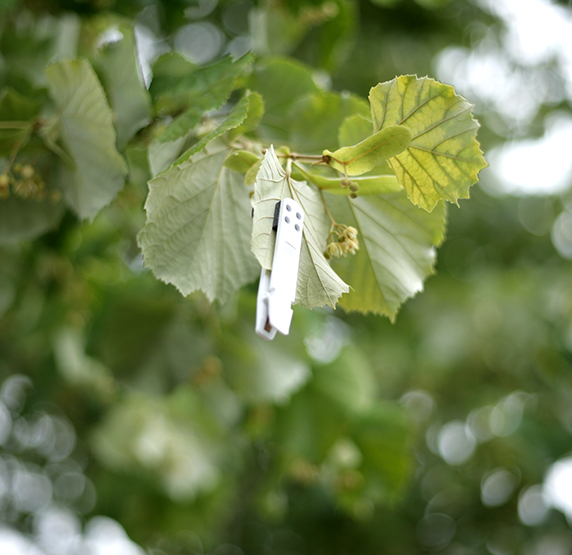 At Barnes Associates Ltd we regularly rely upon a combination of soil and nutrient testing to identify shortfalls in a trees ability to grow properly whether this is influenced by site conditions or physiological aspects of tree growth, which can help inform site management. 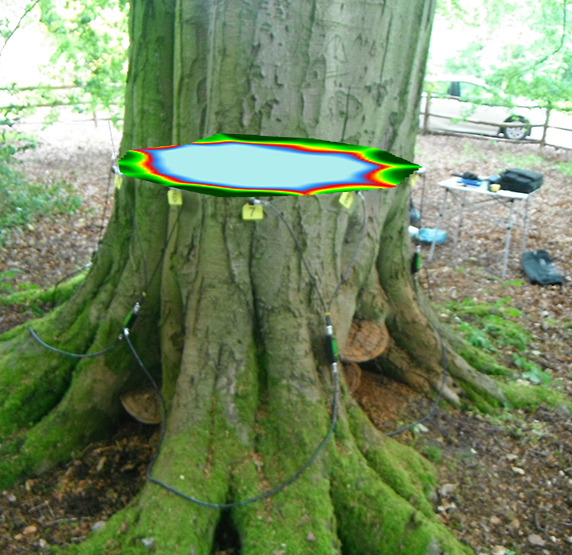 Additionally, reliable information can be provided by measuring tree or plants response to a localised light test. Chlorophyll ﬂuorescence is a non-destructive diagnostic system of detecting and quantifying physiological condition and can be used to identify injury in trees from low temperatures, salinity and water stress conditions. It can also be useful in screening programmes as in many instances the eﬀects of stress can be detected prior to visible signs of deterioration. Chlorophyll content, is an additional test that can identify stress which limits the amount of carbohydrates available for growth and reduces nutrient uptake resulting in leaf chlorosis and necrosis. Exact knowledge of foliar chlorophyll concentrations, i.e. ‘greenness’, consequently provides a robust and accurate estimation of tree vitality. Tree root detection enabling major roots to be mapped. We use various types of advanced equipment such as the Fakopp root detector which can be used to map out main roots. This method is often used when foundation methods such as piling is required and tree roots need to be avoided or where a utility route is being planned. Aerial tree inspections are provided and undertaken by experienced and fully qualified arborists. 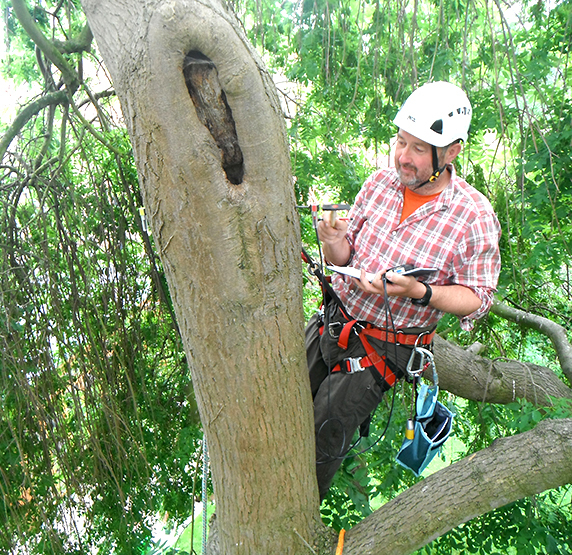 These inspections provide details of the upper tree canopy and can detail defects such as cavities and pockets which can not been seen from ground based surveys often used as part of a bat survey. We often used micro-second timers for these surveys and sometimes tomography systems.